Big wheels? You've come to the right place. No tire alignment or wheel balancing job is too big for Mid-County Auto, Truck and Tire Center, located just west of the Twin Cities in Cologne, MN. While most repair shops only service automobile wheels, Mid-County can also accommodate semi tractor wheels, trailer wheels, dump truck wheels, motor homes, RVs, and most other heavy-duty vehicles. With convenient access off Highway 212 in Carver County, MN, our shop has new Hunter® equipment for balancing and aligning wheels of all sizes, a service very few places are able to offer. With more than 85 years of experience in heavy truck repair, our staff at Mid-County Auto, Truck and Tire Center in Carver County, Minnesota has the ability and know-how to keep you going for the long haul. Whether you have a semi tractor trailer, grain truck, bus, or delivery van, we're looking forward to meeting all your heavy truck repair and maintenance needs. Our shop has plenty of space for large trucks, and our technicians are skilled in troubleshooting all makes and models. Our new Hunter® equipment expands our already broad array of heavy truck and trailer service capabilities, and makes Mid-County a logical choice for your vehicle servicing needs in the west metro area. We can accommodate wheels of any size, ranging from passenger vehicles through Class 8 heavy-duty trucks and trailers. How often should wheels be balanced? Wheel balancing (also called tire balancing) is done when a wheel is initially mounted onto the axle with a new tire, as well as periodically, due to wear and tear. Signs that wheels need to be balanced include uneven tire wear and vibration while driving. 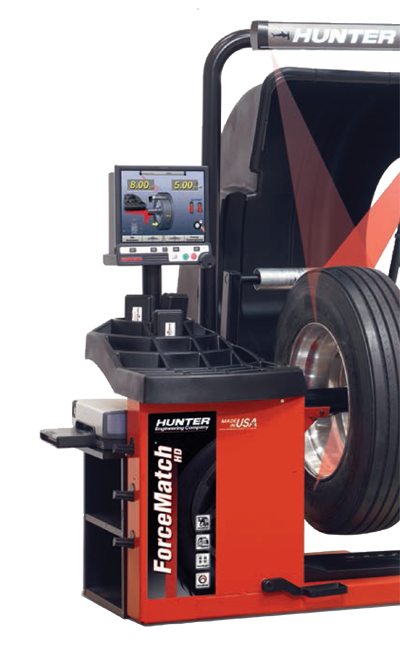 Our new wheel balancing system emulates being on the road, offering superior, accurate results. When is wheel alignment needed? Wheel alignment is typically not needed as often as wheel balancing. Most manufacturers recommend a check every 10,000 miles, and anytime the vehicle has been in a collision or suffered severe road hazard impacts, such as potholes, curbs, or other roadway debris. To prepare for the alignment, we check tire tread and measure wheel orientation. Then, we use our specialized equipment to bring the car's suspension into proper placement. We're 20 minutes west of Eden Prairie, MN and less than 40 minutes from Minneapolis. Our heavy truck repair center is conveniently located at 710 Lake St. W. in Cologne, MN, just off Highway 212. We're looking forward to serving you! To schedule a wheel balancing or wheel alignment appointment for a car or truck of any size, call Mid-County Auto, Truck and Tire in Cologne, MN today at (952) 466-3710. We take pride in serving every customer with honesty, integrity, and value.